Stems: Vines, climbing, branching, herbaceous, glabrous; prickles absent. Leaves: Highly variable, alternate; stipules present; tendrils numerous; petiole thin, .4 to 2.4 inches; blades ovate, oblong-ovate, or round, 2 to 4.6 inches long, 1.3 to 3.6 inches wide, base cordate to truncate, margins entire, lower surface glabrous, tip obtuse to acute; proximal cauline leaves narrower, smaller. Inflorescences: Umbels, many, axillary, 20-100-flowered, globose; peduncle to 12 inches. Flowers: Perianth carrion-scented; tepals 6, greenish, yellow, or bronze, ovate to elliptic, .14 to .18 inch; staminate flowers with 6 stamens, anthers much shorter than filaments; pistillate flowers with 6 staminodes, style short or absent, stigmas 3. Fruits: Berries, blue, nearly globose, approximately .4 inch diameter, glaucous. 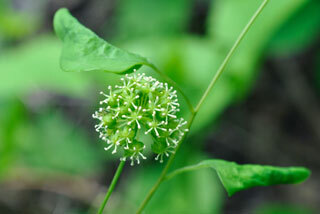 Habitat: Moist woods and thickets, meadows; often in calcareous soils. Uses: The Cherokee used the leaves as a dermatological aid to treat boils and rheumatism; the Chippewa to a decoction of root for back pain and kidney issues; the Iroquois took a decoction of roots for stomach troubles and used the powered root as a deodorant; and the Omaha ate the fruits as food.